Most of the cordsets and transfer switches and panels sold are set up for 4 pole twist lock plugs and receptacles such as NEMA types L1420 and L1430. But some smaller generators and those without control panels may only have the 3 pole straight blade 120V or 240V NEMA duplex receptacle. 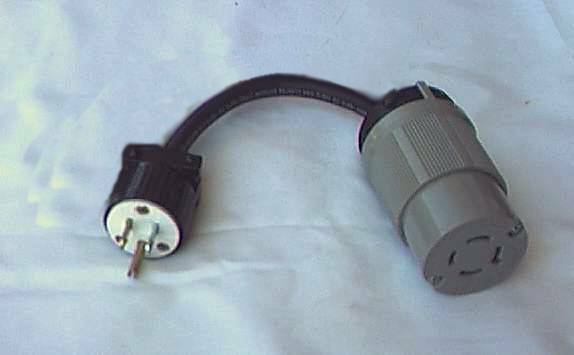 If one of your generator's outlets is sufficient for providing full capacity (or close to full capacity) then simply order this straight-through adaptor. Go here for Y adaptors. Cord clamp with terminal clamps and screws for superior wire holding and excellent conductivity. Color may vary. Assembled from UL listed components. Verify that your generator outlets and connection for other end look EXACTLY like the selected configurations below.